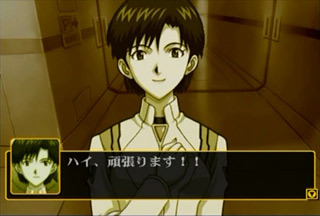 Link to NGE2 psp endings. 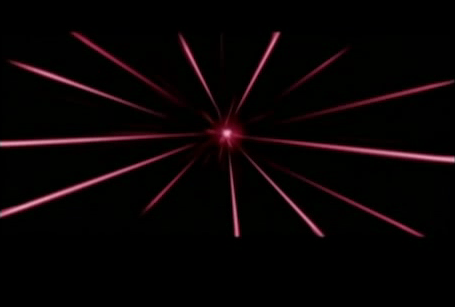 Click the play button towards the bottom of the screen to watch. I don't have experience with forums and stuff if it does not work I don't know how to get it to. 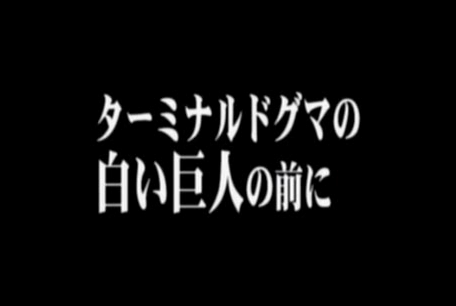 Sorry if you already knew about these videos. 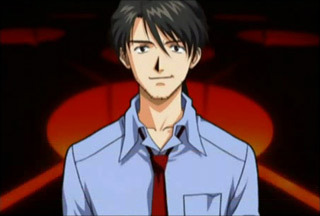 An huge thanks to Reichu, I really liked to know a little more about this game endings (usual Evangelion game, I don't like the game system and there's a huge linguistic barrier), it's really interesting, a decent idea of what Seele and Gendo wanted to obtain with the 2nd Impact even though I wonder how Seele kept Kaworu, they didn't send him in the first place? 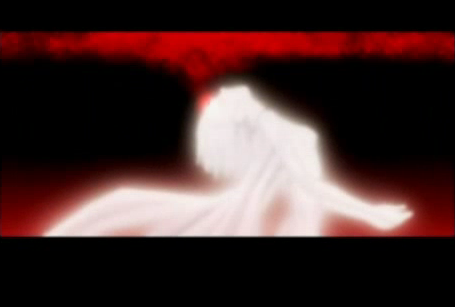 They did the same (mysterious) thing Nerv do with Rei each time she dies?. Well, I never did post the "Thank You" ending... 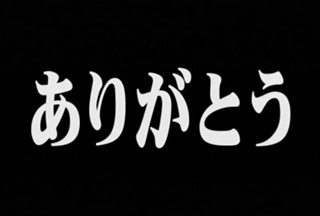 But, here, you get to have a crappy translation of the Angel one instead. 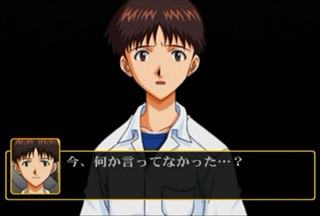 This ending plays in the NGE2 (PS2) game if an Angel reaches Terminal Dogma, which can happen if, e.g., it gets to the Nerv pyramid before you kill it (yeah, kind of lame that things would just end there), or if all of the Evas are incapacitated. Looks like the pictures are bigger than they need to be... but I've spent enough time on this, so you can deal for now. EDIT: The translation is now more complete, but I haven't screencapped these additions. Watch the video if you want visuals. 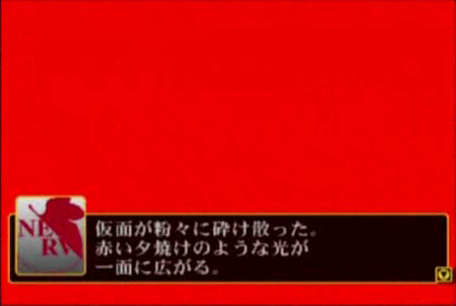 NGE (PS2) - Angel Ending - "Good Night"
Target has breached the zero area! It’s heading for the Geofront! 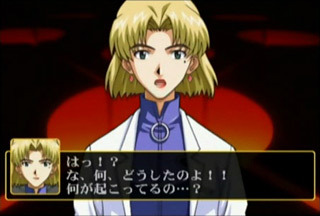 Withdraw the Evas into the Geofront by linear rail! Prepare to intercept! 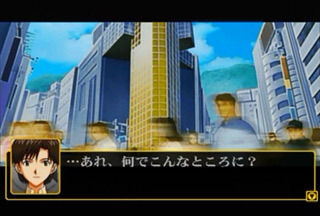 Angel has invaded the Geofront. Currently on a direct trajectory for Headquarters! Eva lift-up completed. Pilots are preparing to intercept! 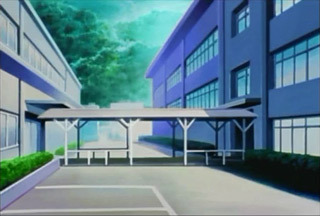 Nerv Headquarters has taken a hit! Target is infiltrating Nerv H.Q. It'll be here any second! The angel, its body transfigured into a milky-colored mist of light, became a bundle of light and pierced the white giant's mask. 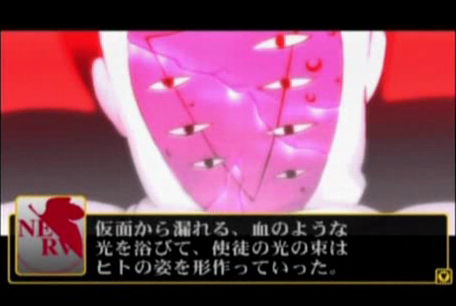 Light that escaped from the mask, blood-like, showered (the Angel), and the Angel light-bundle was molded into a human shape. 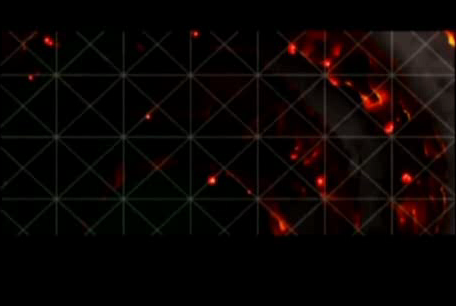 The mask shattered into tiny fragments. Light like a red sunset spread all over. That was when it ended. Or, perhaps, that was when it began. It’s calling for me... Ahh, I've been given permission. I've found the place to which I must return. And meet each another once again. 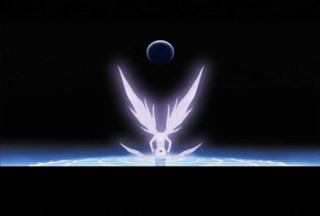 The Angel -- a light that took on human form -- and Rei are taken inside the giant's face, as if being received. 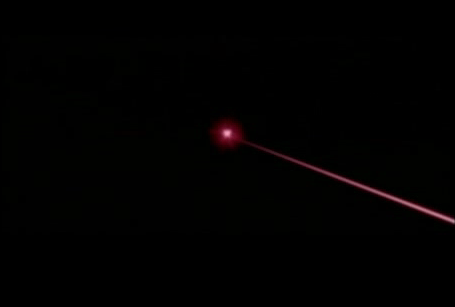 Having completely engulfed Rei and the light, the white giant pulls its hands off the cross to which it is nailed… starts to move. This place is— I see. We’re here. 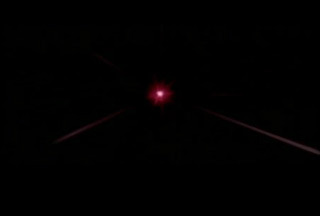 We are within the S² Engine, where the power that spins forever is born. Where what had once been you intersects with others. Look — this is what once had been you. All life passes through here and comes into being. Many lights, waves, are passing by. 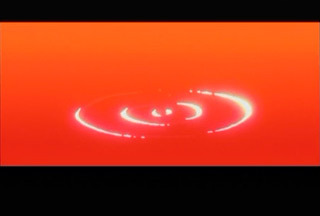 No — you yourself have become lights and waves. And one day, this planet will again be wrapped with life. - I'm as confused as you might be with regard to the pictures not totally matching up with the text. 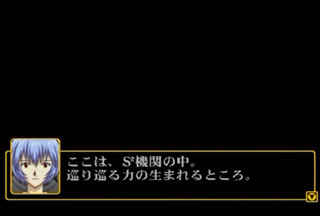 The description seems to say that Lilith's face is exposed and it swallows up Rei and the Angel -- wouldn't have been interesting to see... -- but, yeah. 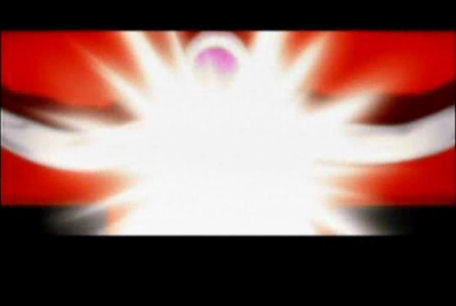 - Why does the Angel turn into a Lilin-sized human-shaped wad of light? Got me... And why is Lilith's face so important here? - No idea why Lilith's forehead is sucking up the souls. It's that way in the regular ending ("Thank you"), too. 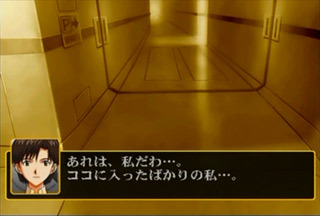 - Also the same as the "Thank you" ending is all of the dialogue from "Where are we?" to "They are with you". 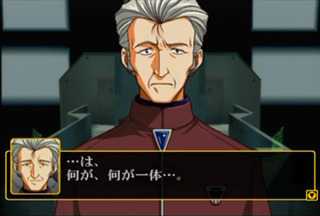 So, yes -- regardless of whether it's the Angel end or the regular end, they still say that you're in the S2 Engine and that the Angels are there with you. 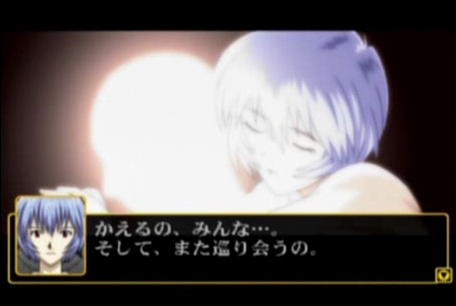 - I'm especially boggled by how Rei magically appears just in time to enter Lilith with the Angel. This will happen even if Eva-00 was so heavily damaged in the battle you just lost that Rei would require a month+ of hospitalization at best. 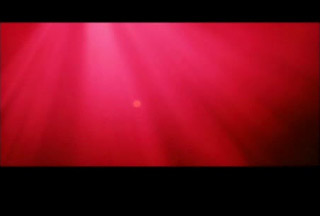 Last edited by Reichu on Fri Jul 01, 2011 12:58 pm, edited 8 times in total. 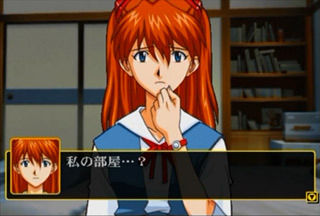 This is an EVA game? Is it text based or something? MaskedOmega wrote: This is an EVA game? Is it text based or something? Nice and creeepy ending. The final "good night" gave me chills. 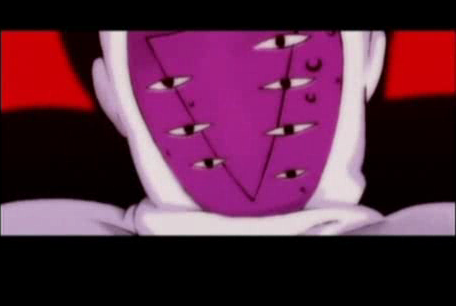 I see. 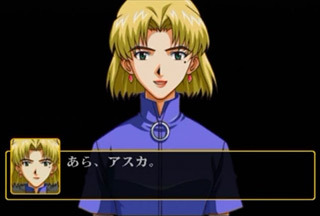 So Rei's solution, in joining the Angel, seems to be to end the conflict between the races by joining them together and resetting life -- starting over Lilith's process entirely. Maybe the "going to sleep" part refers to the (m/b)illions of years it'll take for life to start up again. 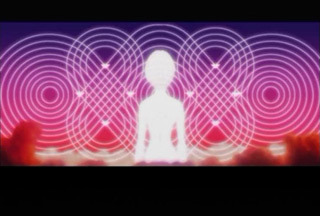 Interesting that the Angel's light form is only able to take on a human shape after getting "sprayed" by light from within Lilith. I wonder if the reason why is because it needs to take on human form before it can try to merge with Lilith -- a case of needing to trick Lilith's autoimmune defenses to get in, if you will. Who knows if the new race to be born would be more like the Angels, though? 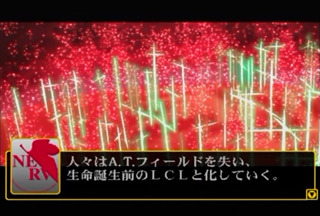 In this ending, and this ending only, they mention the change into light/waves. I suppose that could be taken to mean that everyone is being converted into Angels? If so, perhaps the "good night" refers to the extended incubation the Angels seem to require before they are born. Everyone has to "sleep" for a while before they'll hatch into their new Angel forms. Oooh interesting. Yes, that makes sense. 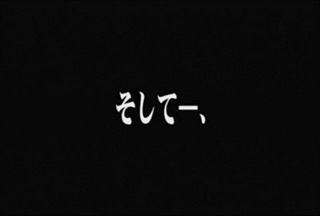 What I'm wondering now is whether Kaworu would have been able to do the same. For example, if he lacks an S2 (because he was "born" in the human form), perhaps he alone among the classified Angels could have done nothing with Lilith. 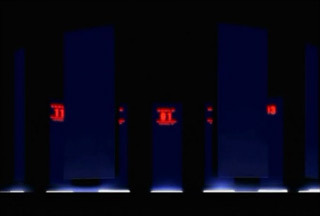 Looks like I had the normal PS2 ending mostly done, so I'll start posting that, I suppose. It's a lot of fluff. 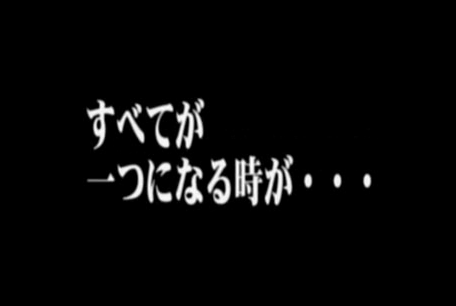 This is the ending acquired when the MP Evas are defeated. 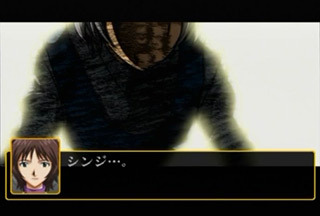 There are some minor variations that present, dependent on such things as who you are playing as, which characters might have bought the farm over the course of the game, etc. This isn't an exhaustive compilation; it's just whatever I'd happened to put together last summer. 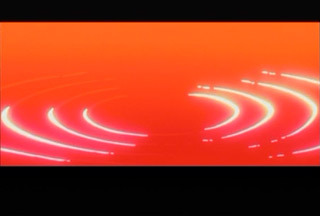 The Eva Series have gone silent…! 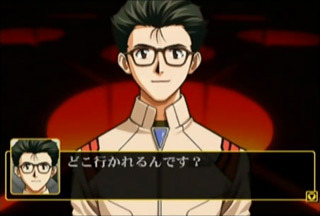 Hurry and recover the Eva units and pilots. A high-energy body is currently ascending from Terminal Dogma! Is this a… humanoid? 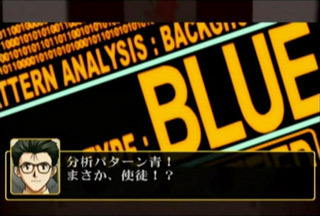 Analysis pattern blue! 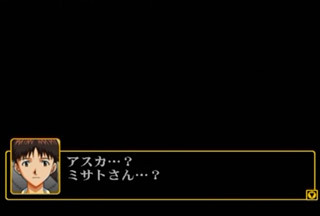 It can't be -- an Angel!? No, it's not. A person -- it's human! ...The First? ...Who are you? Come home, everyone… and meet each other once again. The Eva Series have released their S2 Engines. 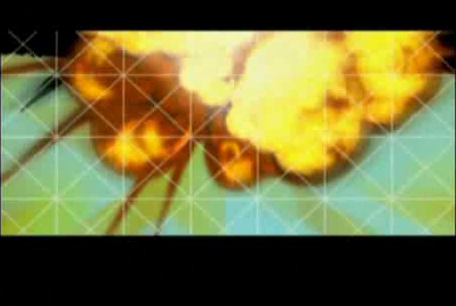 This is just like the initial phase of Second Impact! An Anti A.T. Field is materializing. The Anti A.T. Field is breaching the critical point! At this rate, lifeforms won’t be able to maintain their individual shapes! 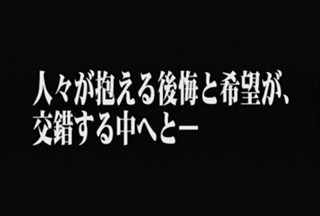 The Instrumentality of Mankind began. Huh, why am I here...? What… am I doing here…? 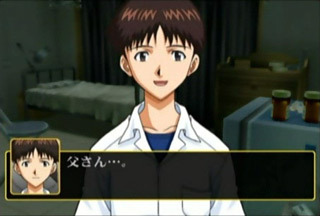 Stupid Shinji. What are you spacing out for? 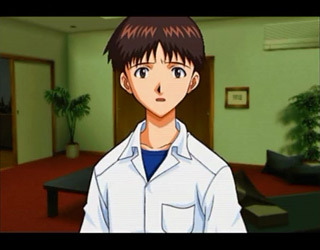 So there you are, Shinji. 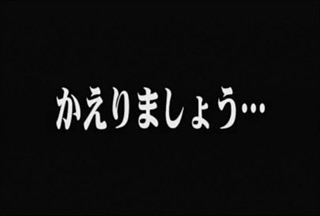 Shin-chan… You’re always crying, aren’t you? You seem a little down today. 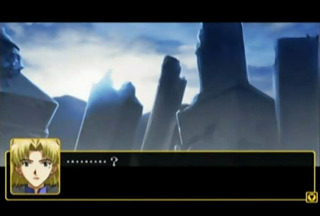 What is it...? If something's wrong, you can tell me. It’s not like you to be so worked up. So it would seem… Do you agree? What in the— Wait, is this—!? Yui?! No, that… is how things used to be. It’s only been that long since I was here? …What in the world is going on? I was only just here? For a walk. How about you, Mother? Where are you going, ma’am? ...Huh? What am I doing here? Yes, ma’am. I’ll do my best!! Is it okay if I call you “sempai"? That’s me… When I’d only first started here. Is this a dream? What’s going on? Don't feel like doing the time-consuming screenshot thing right now, so the rest of the characters can settle for dialogue only. Until later. Last part has pictures, though, just because. 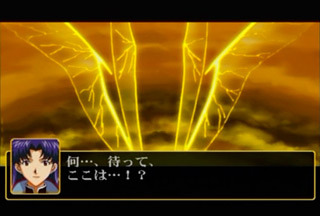 Note the overlap with both the Seele and Angel endings. How did I get here? Shouldn’t I be at the Command Center?? What’s going on? Is that me…? Won’t you come up? We could have some tea. Um… Yeah, but I have to go back (to work?) today. I wonder why I turned down her invite back then. 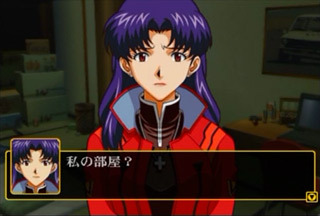 But, even though she’d asked me out, I realized that I probably wasn’t the one Misato-san was looking for. It won’t work out. They say I’m not good enough. Hold on! We can’t just stop playing. 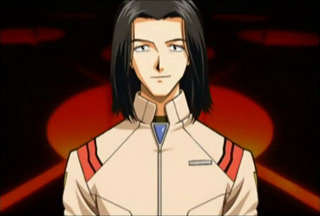 That’s me… Back when Teruo and I were in school. 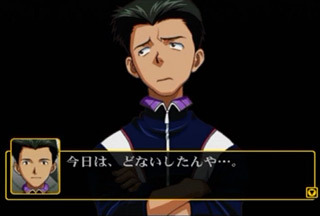 …Teruo? You’re going to debut and play some good tunes. I’ll be cheering you on. Since I talked to the office again, we can try to do this together. Right, that was when I thought I wanted to play one more time. 誰を見てるってワケでもなく、私とも…とはね。 I’m guilty of the same. We won’t forget this day. 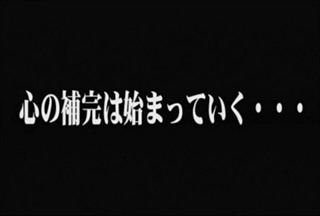 That’s what I thought… Third Impact has started, hasn't it? That's right, my sister. Is she okay? 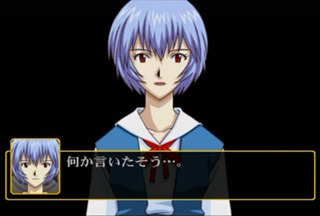 Ayanami, you came here too? Big brother, let’s get out of here. Come on… let’s go home. Huh? I’m at the classroom at school? What the heck…? Why did I come here? 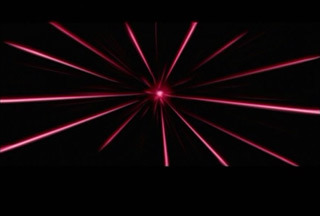 People lose their A.T. Fields and turn into the LCL that predates the birth of life. Only the human souls flow across the Earth's surface in a precarious drift. We abandon our useless bodies to become one with God. Due to our guidance, the path that both ends and rebirths all life (has been opened). So we've been made to remember our original forms. If we're unable to recognize Lilith, we'll vanish into nothing. And Lilith, you do not wish for that. Isn't that right...? 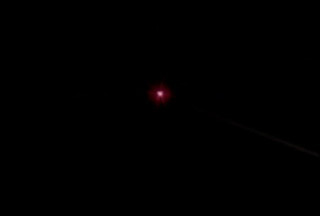 First the red lights floating in Kaworu's vicinity, and then the red lights from the entire Earth, head toward and flow into Eva-01. The human heart can only open up to (other) people. Lilith, is this all right? I see, so I am allowed. Thank you, for all that you have taught us. 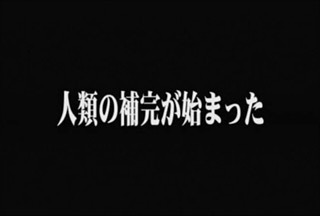 The dreams…, tears…, pain…, and serenity. Everyone is here with you. Interesting... 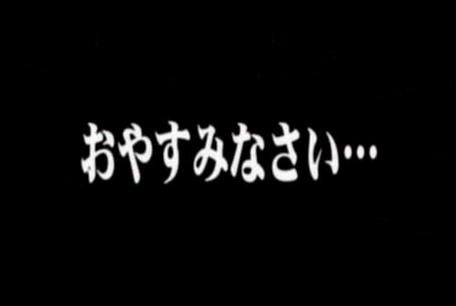 If this is in fact the "normal" ending that reflects EoE (except that we're not shown the part afterwards where Shinji and Asuka are together on the beach), Rei's promise that "Everyone is here with you" would implicitly confirm the "everybody revives" interpretation of the ending of EoE. The part where she says "Thank you" seems to imply that she is -- this is my interpretation -- thanking humanity on behalf of the Seeds for teaching them things. ...Unless she's thanking all the people who are stored in the S2 engine? Whoa! At first I thought that second-to-last pic was of a speared harpie sticking up out of the water like what we normally see, but now I see that it's Eva-01 with long flowing hair and spear in hand. Crazy! ...And awesome-looking. I'm not really sure where this ending is meant to fit in, but I would guess that it is some sort of alternate. 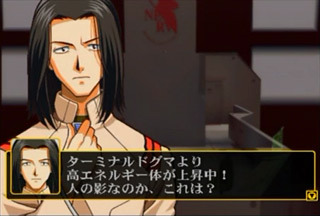 Something equivalent to the EoE ending is included with the PSP version, but not the PS2 one. As for exactly what happens, and why... I seemed to get the impression that everybody was channeled into Eva-01 (including Kaworu, with Lilith's blessings? 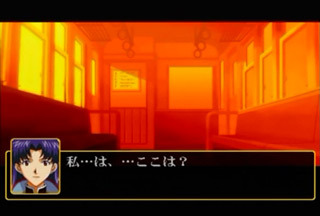 ), and then Rei thanked her (Yui/Eva) -- the one with whom everyone is now with. 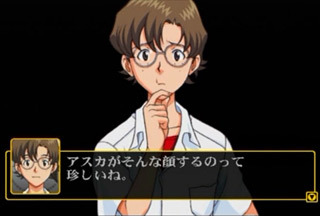 Note that the "you" to whom Rei refers is in the singular. But, really, I have no idea. :? These endings are so damn vague. 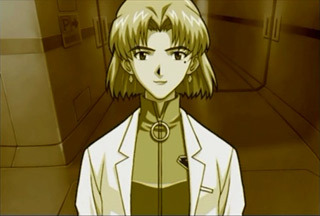 Here's Hair Club Eva-01 a little bigger. 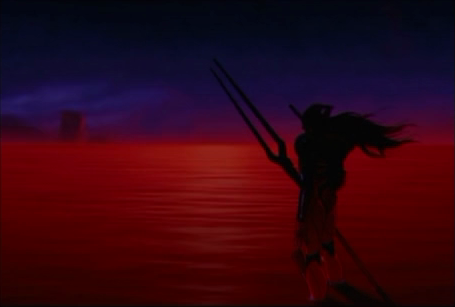 Contrast that to the end of the Seele ending, where Eva-01 is standing around with no hair and no Spear. That sounds to me like in both cases there's been a permanent instrumentality set up, now active as a unified being in the form of 01. 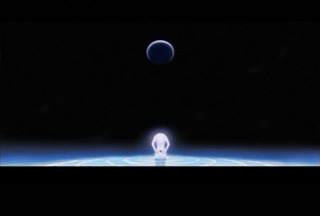 The only real difference with the Seele ending's outcome is that everyone (including the angels) is invited to join this one, rather than just the inner circle. 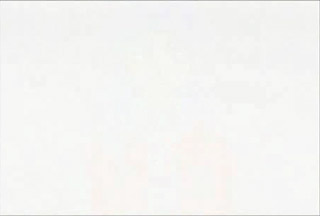 Do you have a bigger version of that image? 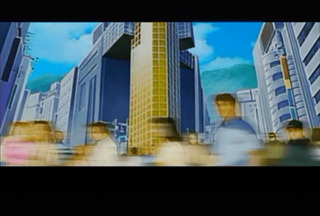 liquidus118 wrote: Do you have a bigger version of that image? Fair enough, I just was thinking about making it a wallpaper or something. No big deal since I have plenty of others. Keep up the good work with the endings, by the way. I thought that in other threads people mentioned different endings that were basically EoE's but with Kaworu and Shinji, is that in NGE2? 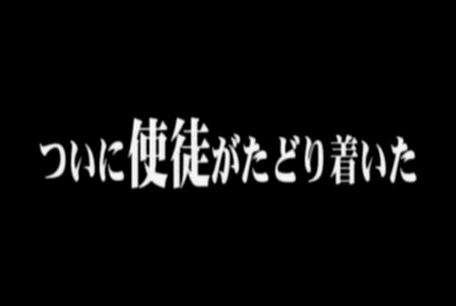 Reichu wrote: I'm not really sure where this ending is meant to fit in, but I would guess that it is some sort of alternate. 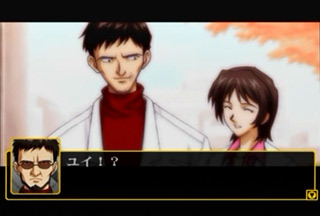 Something equivalent to the EoE ending is included with the PSP version, but not the PS2 one. 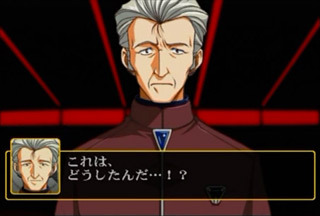 Wait, so, in the PS2 version, there's no ending which corresponds to EoE, the best ending you can hope for (short of averting 3I entirely) is total complementation? 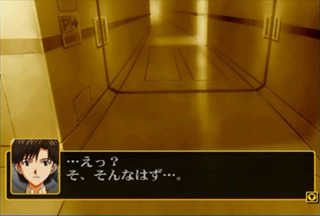 A game which was designed in the first place to hold the answers to the series does not even allow an ending where what happens in the series takes place? As for exactly what happens, and why... 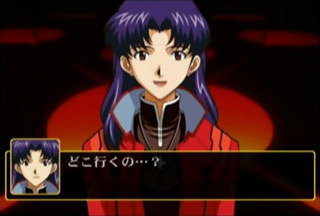 I seemed to get the impression that everybody was channeled into Eva-01 (including Kaworu, with Lilith's blessings? 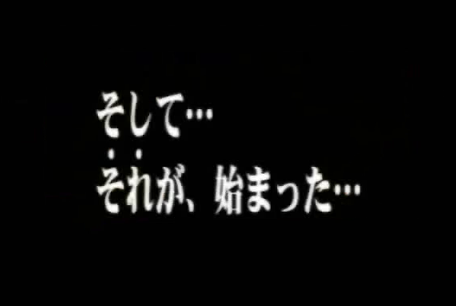 ), and then Rei thanked her (Yui/Eva) -- the one with whom everyone is now with. 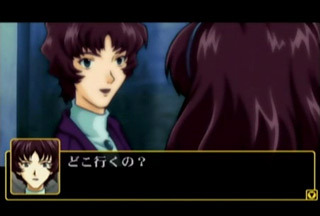 Note that the "you" to whom Rei refers is in the singular. Oh, hm. Hah, this is one of those rare cases where Japanese makes a distinction between singular and plural where English does not. 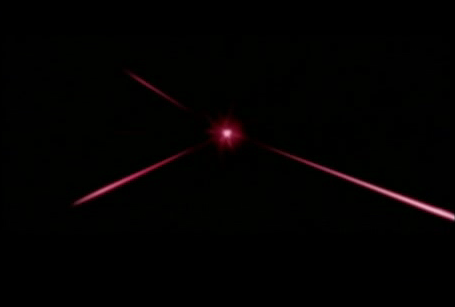 I notice that the souls all enter GNR (through the forehead no less), just as in the Angel ending, but wind up in Eva-01's S2. 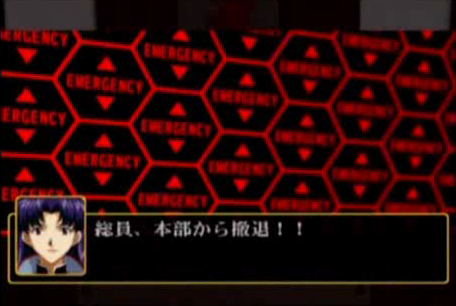 It has to be Eva-01's S2 because she says everyone is with "you" now, not "me", herself. 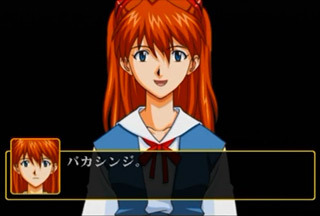 This makes me think about something: Perhaps the reason GNR absorbed Eva-01 into her forehead in EoE was for the purpose of transferring the souls into Eva-01, to use that body as the complemented being. A gestation, if you will, which fits the egg-and-sperm symbolism we see going on inside GNR. 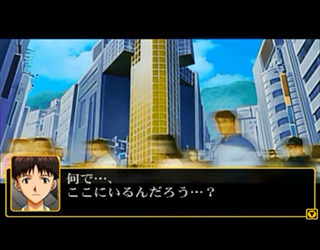 If this ending is basically what would have happened in EoE if Shinji had not changed his mind, then it indicates that GNR's only purpose was to birth the god, not be the god. 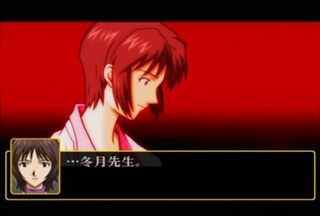 In other words, this would finally explain why GNR's neck split open even before Shinji made his decision: GNR was going down no matter what, the only question was whether or not what would emerge from her would be the complemented being. 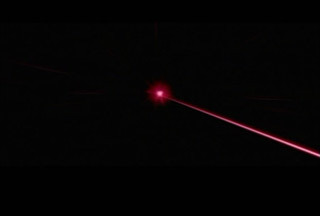 (So in other words it symbolized that the process was ending fast and Shinji made his decision at the last possible moment before the point of no return.) 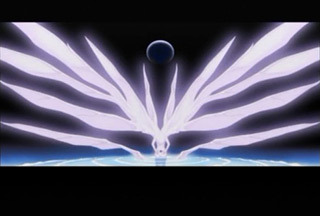 The Eva emerged as a god-creature either way, even with just Yui (and possibly one or two others) inside. Just found this from another thread. Wonderful and meticulous translation. Saw one with ?? mark so I would like to see if I can help. 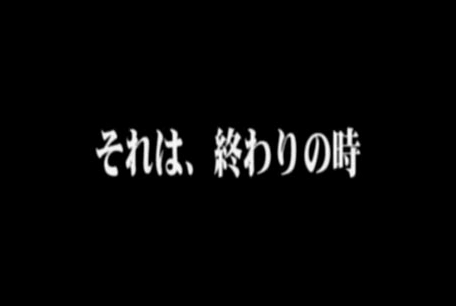 For the dialogues and captions for other endings, if there are original Japanese text I can help with double-checking the translation too. Just noticed this thread has been bumped. 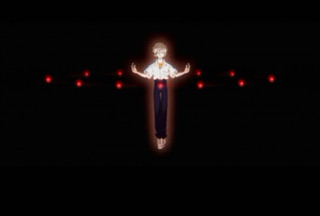 I'm trying to remember what Instrumentality variation is Kaworu naked in (instead of clothed in his school uniform) with those surrounding lights (I forget if they're Angel souls or Seele's souls) but yeah, like Reichu said, the Seele Instrumentality ending has Eva-01 standing there with no hair flowing and no Spear. 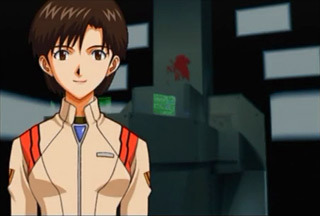 I forget how extensive my notes in the forums were on the different (5 or 6 total) Instrumentality game endings (I'm assuming they're in the giant Eva2 thread in Everything Else, but maybe it's somewhere in Discussion). 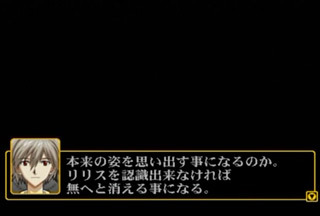 Still, nice to see this translated properly (instead of any incorrect mental-translations of mine as I play(ed) through the game). 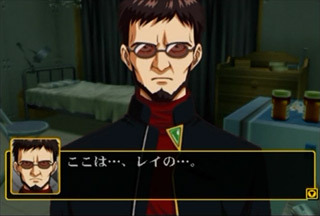 Also: I know for Shinji's Scenario 01 in the PSP game, his Best End is Rei rejecting Gendo and checking on Shinji after Shinji defeats the Harpies/saves Asuka (Misato died EoE-style, Kaji died from Seele-goon, Fuyutsuki says something to Gendo about how Gendo has to let go of Yui/the past, Seele were apparently thwarted with the Harpie's defeat so Third Impact was averted so everybody else lives on as Rei and Shinji hold hands. Yay! 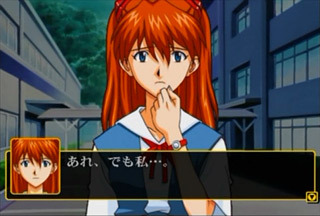 Sadly no mention of Asuka in the ending--but--you can only reach this end if Asuka is saved by you (Shinji) stopping the Harpies.) 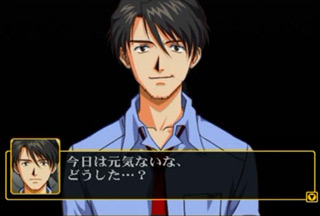 while the Bad End (scenario unable to be Cleared) is EoE events (Rei joining with Lilith and reaching the Harpies, Shinji freaks out, everybody is Tanged, Shinji is in the LCL Sea with Lilith and Adam then rejects Instrumentality, he says goodbye to Yui (who says something about her plans) then he's on the beach laying atop of Asuka, "Kimochi Warui. 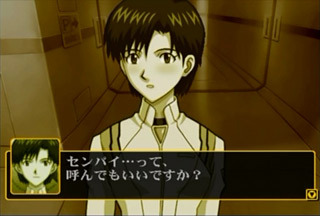 "), but I could have sworn Shinji's PS2 01 Scenario included both ends... Then again, it's been some time since I played my copy of the PS2 version (I don't have a PS2 currently) so my copy of the PSP version is the main version at my disposal. I would like to see Asuka and Shinji holding hands at the end though. 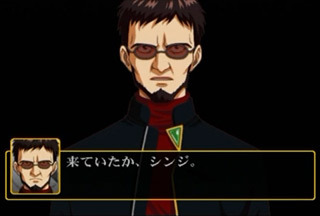 The good ending has Misato, Kaji and others dead with no hope of revival? 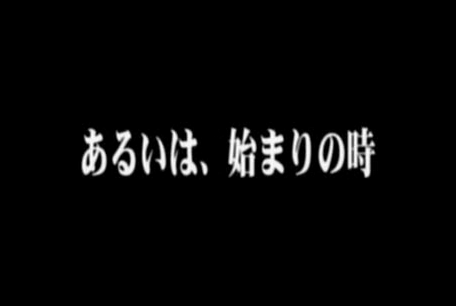 The good ending?